After years of abstinence I have decided to follow the call of the sword once more. Returning from deployment in the far galactic north of the ultima Segmentum Marshal Vespasian and his moderate crusade force got cut off from the chapter by the cicatrix maledictum opening and the Emperors' guiding Astronomicon falling silent. Confused by the impossibility of communication and overwhelmed by calls for aid from neighboring systems the crusades' officers gathered to decide their best course of action. When the young Initiate Gernot reported dreams of fire, a black sword and endless carnage beneathe soulless stars holy wars and the golden throne coming to light once mor, a decision was reached: No call to war would go unanswered. During the absence of a higher guidance hate for the enemies of mankind would be all the guidance the brethren needed. The would be what they always were: the spear of humanity, the avenging light of the Emperor on Terra. Deaf and blind the next crusade started. Imperator Vult! I wanted the banner to say "Pilum humanis - Lux ulciscenses" above it, but the generator I used only gave you one scroll and that was to short for that motto so here I am. I find the divisions and banner stuff looke pretty good though. So yeah I haven't played or painted in ages. But now with the story moving forward I got interested in 40k again and then I started thinking about kill team which led me to think about my templars which were gathering dust and so forth and so forth. I ordered some paints again, built a wet palet, removed the arms from my assault marines, scrounged together all the power weapons I could find and am currently planning to make them into a Vanguard Veteran squad. What I'm doing right now is renewing the paint on my marines, because for some reason I can't really explain myself I seem to do better at painting this time around and am not really happy with how my models look right now. As far as painting goes I'm going with the usual black templars scheme obviously but all my models get a half white, half red right knee guard. Veteran Sergeants will have a decending golden stripe in there. Veterans (aka sword brethren as far as I am concerned) have red pouldron edges and golden casings on their weapons, while initiates get black wepaonscasings and black pouldron edges. I havent made my mind up yet about Primaris yay or nay. I like the look of Intercessors and hellblasters. I don't really like the other ones. Except for the apothecary. That dude looks awesome. Edited by Marshal Vespasian, 28 July 2018 - 11:14 AM. The Vanguards I plan to build from Black Templar Sprue bolters with Kromlech silencers and Kromlech Scopes. I plan to use the Vanguard legs, because I like them and use the robed torsos from Spellcrow. As far as wepon choices go: I disarmed (heh) my assault marines, to give them power weapons. Models with special weapons will from now on get magnetized arms. That includes the devastors, most of which I still have to build. Equally Ini-Neo or close to equal whenever possible. Rhino squads should be 5-3 or 5-4. That being said. While I get why, a Crusader Squad when wanting to Melee needs to be a tide. Rhino squads were fire support squads sub 13-14 Man squads are really too small and too few attacks. Also your power sword initiate is better as a Heavy Bolter sense it’s inefficiency is painfully highlighted in small squads. Larger squads the inefficient one attack power sword is not an issue because you have 10-12 other models attacking so being marginally less efficient doesn’t hurt. Any competent Chaplain should be concerned about Khorne's influence the moment he heard this. Were there none in this Crusade? No one to make sure this "Emperor's Champion" won't become a Champion of the Blood God? I told you. Psykers. This one is getting visions from the wrong warp entity. Edited by Bjorn Firewalker, 06 August 2018 - 05:49 AM. First of all, welcome brother! It is good to have you among us. I love your chapter badge, very well done. During the absence of a higher guidance hate for the enemies of mankind would be all the guidance the brethren needed. This is all you need to know. Go get 'em...all of them! Thank you for your replies brothers. I edited the short fluff piece a bit, to make it less ambigouus. Does someone have advice on what kind of paper to use for printing your own decals? I saw the templar sheet in ye olde decal project and got thinking about using variations of my crusade coat of arms for banners and for vehicles. Concerning the army list: wargear choices are getting to work what I have right now. I can put some more power swords in the crusade squads, no problem, as long as I have the bits. 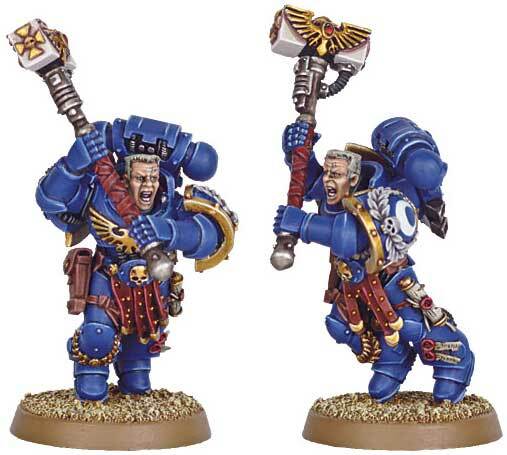 Might mean that I have to take another energy fist oder a power maul with my vanguard squad, but I am okay with that, as that would enable them to take on some tougher enemies. I'll have to see. Propably will buy a mix of some more power swords at some point down the line then. Oh should have said that before. I'm currently based in germany. I will move to switzerland for the Winter, but thats still some time off. Ok, so Europe, as opposed to N.America. I purchase all of my decals and decal paper from a firm in the UK called Veni Video Vici. They also do blank A4 decal paper in clear and white. As your design has a big white bit in it, buy the white paper. Printers don't print white, they just miss it, so if you use clear paper the white bits just go clear. If I want to prin out heraldic shields I'm afraid that I might loose some details when going small. Does what I would see on a normal piece of paper roughly translate to what I would see on a decal paper? Meet Crusader squad 1. 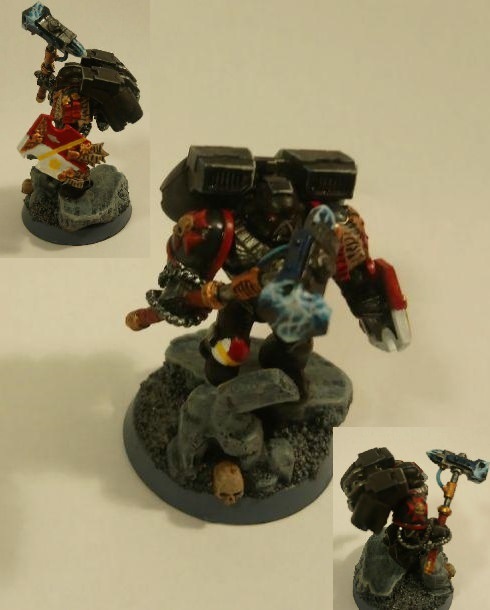 The neophytes got a black number one on one shoulder guard and the crusades coat of arms colors on the other one. Initiates have the same, just on their knees. These are all models I already owned, that I repainted. Exceot for the sword brother who was already in an acceptable state, also he has been sprayed in Army painter quick shadow I think or maybe some matte coat. I'm not sure, it's one of the old metal models. I have a whole squad. I'll try to remove the paint on one of the ones carrying chainswords, so I can see if it works or not. On that note: do you suppose, that a forgeworld imperial fists templar sword would fit one of those models? Chainswords were glued on as hands holding chainswords, not entire arms. Edited by Marshal Vespasian, 08 August 2018 - 10:06 PM. So apparently I can strip my glazed metal swordbrethren of paint. So I did that for the first one and reprimed and repainted. Also did taht for Crusaders squad 1s 4th and final neophyte. Turns out that yields superior results when compared to painting over old paint. So withouth further ado meet the honorouble borther Frederik, Avenging blade of Atakanis 5. When the forge World of Atakanis 5 was overrun by heretek butcher-cults and their gore engines, brother Frederik was on the ground negotiating for supplies with the administrators of the world. Cut off from communication and resuplly, Brother Frederik had to hold the Frogecomplex primus for hours until reinforcements would reach him. By that point he had gathered a small force of mechanicus skitarii and preparde to strike at the heart of the rot that had gripped the forge. 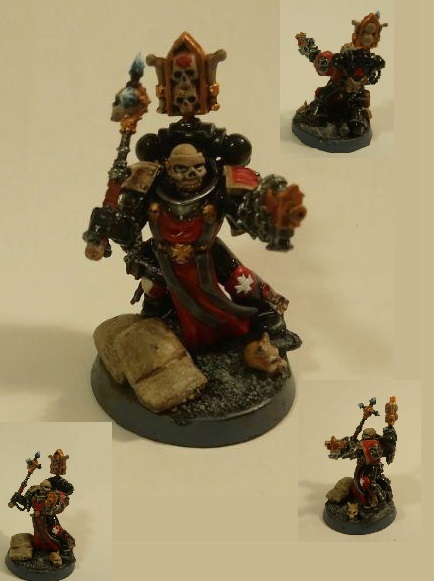 For his bravery he was rewarded with the honor of leading the avenging strike, that saw the Cabinet of Murder-Cardinals and their Crimson Pontifex slain and the Forgeworld indepted to the chapter. In recognition for hist skill in organizin a force on the battlefield brother Frederik was rewarded comman of a squad of initiates and their Neophytes, to serve as their battleleader and teacher. So yeah pretty happy with that one. I experimented with getting better pictures. Which I would say I did. But I feel like I could still improve my picture taking setup. Also maybe I should try another camera app. Reading all of you brothers crusade threads made me feel like I should give a status update to the eternal crusade. I have the first crusade squad painted completely, but I wish to give the initiate with the Power sword another blade. The second crusader squad (ranges) is done except for the heavy brothers arms and bolter which are as of now in the mail. The third crusader squad has 4 initiates and one neophyte done. Sword brother and 4 more neophytes to follow. 7 out of 10 vanguards are done as well as some 3 or so axes, so for 1k I will have to do 2 pairs of arms with storm shields and Hammers. to switch to 32mm. My 32mm bases are in the mail with the heavy bolter and some other stuff. Next up will propably be the bike squad. Or maybe something that fits with whatever Knightfall may bring. A box of start collecting space marines, 10 neophytes and some bits arrived at the crusades flagship today. Also bases are based and the spray is currentyl drying. 5 Intercessors and a host of armaments created in the forges of Miniatus Maximius III are still in transit to the fleet. Edited by Marshal Vespasian, 06 September 2018 - 09:57 AM. Troops are almost done or at least I keep telling myself that. I am actually pretty okay with how they came out. I am especially glad, that I switched to 32mm bases, because sweet Emperor these look great with marines! Especially with the neophytes next to them, good call on GWs part to switch to bigger bases. Crusader Squad 1- Melee. They are complete as are. One old Metal sword brother. The Powersword for the initiate is magnetized. Crusader Squad 2 - Ranged Crusaders. The Heavy Bolter Initiate is Missing his HB, I still have to build it, will paint it whith my Knightfall vow. Heavy Bolter Initiate and Sword Brother are completely magnetized. I did the Sword Brothers Cloak with green stuff. Quite happy with how it came out. Apparently I forgot to paint one bases rim. I'll do that the next time, I have my paints out. Crusader Squad 3 - Melee again. It's missing 4 neophytes. The Sword Brother still has to be painted. I like his sword, its forgeworld Templar Brethren. So this is what my crusade looks like at the moment. The next step will be completing squad 3 and then two Rhinos, followed by my bike squad and updating 2 vanguards with th/ss for 1 k points. As well as 2 HQs, jumping TH/SS Marshal and Chaplain, wich I will kitbash. For Dorn, Sigismund and the Emperor! Your Crusaders are well done. Edited by Marshal Vespasian, 20 September 2018 - 09:56 PM. 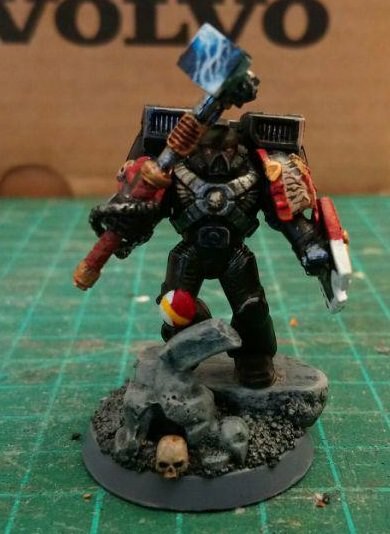 Your Chaplain looks promising, but why is there a knife buried in a sandbag on his base? I doubt it's the Chaplain's own, as no son of Dorn is foolish enough to damage his own side's defenses. Did the knife belong to an enemy, who was put down before he could stab the Chaplain? In that case, you should decorate the crozius with bloodstains. The skull helmet is really nice. It reminds me the masks of Necromunda Redemptionnists (who are zealous as well ^^). Thank you. I am quite pleased with how that kitbash turned out. I just got my bottled matte varnish in the mail yesterday, so I will put that on, to tone down the gloss from using eshin grey + abadon block, washed 3 times with nuln oil for the armour. I still have two rhinos sitting on my desk, which I have to finisch, hopefully in the coming week. Then it's three bikes with meltas and finally my marshal and the crusade will be at a thousand points. Not counting the cenobytes. But I will only get those models coming decembre so yeah. I actually really like that model. I think I might sculpt a tabard on it, give it a cape and magnetize a jump pack on. Add some chains and a storm shield strapped to the left arm and the crusade should be good to go for 1k. Sadly I am not the best sculptor but accept any challenge, no matter the odds . Also I am not quite sure about how I will sculpt storm shilds as I still need one for the captain and some five or 6 for my vanguards (I had two in my bitzbox from 2 boxes of assault marines). Getting the Kromlech Kreuz-Pattern shield is kind of tempting, but I am not sure. I Think some thick plasticard and some thinner plasticard to cut details like crossed and the like from might be the better option. Edited by Marshal Vespasian, 11 October 2018 - 10:51 AM. Well done. I like the lightning effects on the thunder hammer.